From http://GrateTV.com comes a BBQ show that takes viewer questions and show user submitted Grate Plate photos. ;This week hosts Jack Waiboer and Bill West discuss Fat Side Up myths and investigate the uses for electric knives. Mix:2 tsp salt, 1 tsp black pepper, 2 tsp garlic powder and 2 tsp chili powder. Spread rub generously all over meat. Spray inside of crock pot with non-stick spray, and pour beer in bottom of crock pot. Set meat in, cover and cook on low for 9 hours. If necessary, open once after about 5-6 hours and drain some liquid. Remove meat and drain all liquid after 9 hours. Put meat on a baking pan and pull apart into chunks with two forks, removing bones and fat. At this point, BBQ can be portioned out and frozen for later use if need be. Saute’: Green pepper, onion, remaining garlic powder and olive oil until just transparent. Do not overcook. Set aside. Cook: Barilla Cheese & Spinach Tortellini, according to package directions and drain. Stir: Ketchup, water, vinegar, sugars, onion powder, mustard, Worcester sauce, lemon juice, molasses, hot sauce, Cayenne pepper (if adding) and remaining salt and black pepper in a medium saucepan. Bring to a boil and reduce heat. Add 3 heaping cups of pulled pork and the saute’ed vegetables to the sauce and heat through about 3-4 minutes. Serve over tortellini and enjoy! Three quick tricks for London Broil and tenderizing beef. Step through the process of preparing this easy and fantastic grilled feast. London Broil Can be a tough cut of beef. 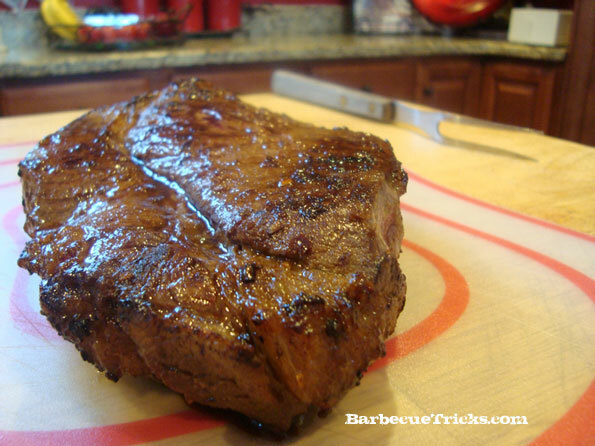 Here are three simple tricks to maximize tenderness in the beef for your next barbecue with friends. It always starts with a nice clean looking London Broil. 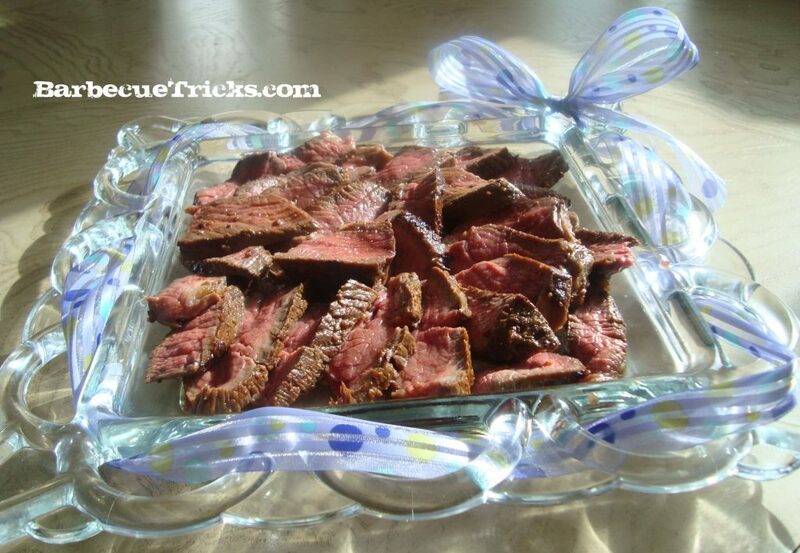 This method and recipe below also works great with a flank steak or skirt steak for Fajitas. hammer it. Another trick I show in the video is to wrap the slab in plastic to avoid shirt staining splattering. Secondly, use a nice marinade to soften the newly damaged fibers. Some grillers may choose to use a high acid marinate to boost the tenderizing effects. Third, let the cooked meat rests for ten minutes or so (it’s pretty important but usually people get in too much of a hurry). Carve your London Broil AGAINST the grain of the meat fibers or perpendicular to the strands of beef in pencil thin slices. It’s another level of jaw grinding your guests don’t have to deal with and the presentation is awesome. The Not So Secret marinade here relies on a dose of smoke but it’s super easy. From http://GrateTV.com Barbecue grill cleaning inside and out plus a super hot secret ingredient imported from Japan. ; A viewer submitted GratePlate and more.